Iowa has 44 cases of bird flu in 12 counties. In Wright County in northern Iowa, the two farms saw an unusual number of chickens dying and sent samples for a preliminary test, which was positive for H5N2 virus. If confirmed, the 4 million birds will be euthanized and Iowa’s chicken loss will approach 25 million — more than 40 percent of the state’s egg-laying flock. (Reuters) – United Continental Holdings Inc said on Friday that it expects to pay more per gallon of fuel in the second quarter than it had previously forecast as oil prices inch up and chip away at airlines’ energy savings. When Toby Emmer’s father was diagnosed with Parkinson’s with dementia, she knew she’d need to travel from New York to Cleveland frequently to care for her dad who had sacrificed so much for her. “The day I told my boss that I needed to take some time off to be with my dad,” Toby said, “I knew I would get full support.” She used the nation’s unpaid leave system, FMLA, to secure her job. Paying her bills was another matter. Being there for her dad took a toll on her finances that she’s not recovered from since. What Toby desperately needed was paid family leave that can be used to care for self, welcome a new baby or comfort a very sick family member. 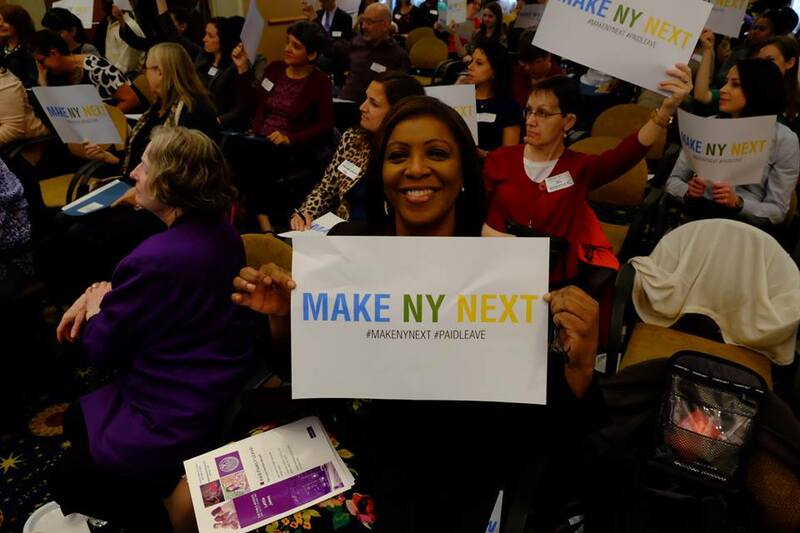 Toby shared her story with a packed audience who came together in late April to #MakeNYNext for paid family leave. “The Empire State wants to join California, New Jersey and Rhode Island in making certain that workers don’t have to choose between the job they need and the family they love,” Toby said. She worries about the financial security of families that don’t have paid family leave. Toby is right to worry. As we look toward this Mother’s Day, with women nearing 50 percent of the paid workforce, families depend on mothers earning a living wage. That’s why most women and men call for policies that help workers keep their income while they’re caring for themselves or a loved one. The U.S. stands alone with Papua New Guinea in having no paid leave program for new mothers. By comparison, all of the countries we trade with and a total of 178 nations across the globe have a form of paid family leave, usually for women after childbirth but in many countries, for men as well. Today we are seeing a national push for paid family leave. The Family and Medical Leave Insurance Act (FAMILY Act) was introduced by Senator Gillibrand (NY) and Representative DeLauro (CT) calling for 12 weeks of paid family leave to be used to welcome a new baby, recover from extensive illness or be there to care for a sick family member. That’s not all moms need. While women make up almost half the workforce, they are over-represented in low-wage work such as childcare, food services, retail and healthcare. These industries and communities have a lot in common: low wages, lack of paid sick days; unfair scheduling practices, unequal pay and unsafe policing. Nearly 10 million workers have won the right to take paid days to care for a sick child or to nurse a cold. That’s because they live in the 3 states and 18 cities that have passed a law requiring employers to permit workers to accrue sick time. The Healthy Families Act is the federal bill that if passed would permit workers in firms of 15 or more to earn up to 7 paid sick days or 7 job-protected days for those in smaller firms. These are job security policies that protect workers from being fired or docked pay just because they have a cold. They also go to the heart of public health needs. Paid sick days are your mom telling you to “wash your hands” – on steroids. Too many workers, especially women, are victims of poor scheduling practices. Either they don’t get enough hours or their schedule is unpredictable, ensuring that they can’t add a second job, plan childcare or attend school. The Schedules That Work Act allows an employee the right to request that the employer change the terms and conditions of employment relating to hours; the location of employment; the amount of notification for work schedule assignments; and minimal fluctuations in scheduled daily, weekly, or monthly hours. For most Americans, wages have been flat for 30 years. It’s clear why fast food workers have been striking. and why they’ve been joined by retail, childcare, homecare and other workers who call for decent wages, full-time work and the right to join a union. These basic rights are critical to the foundation of our economy because we know that more money in the pockets of workers means a stronger economy and more secure families. Moms also want to see passage of the Paycheck Fairness Act and an end to pay discrimination. Finally, while these issues are part of a broader restructuring of our economy, there is something more fundamental to all moms. The survival and prosperity of our children is basic to who we are. There is no law yet, that goes to the heart of this fundamental problem. But there are too many lives lost, snatched away by gun violence, including many women and girls who’ve also been murdered. Join the movement for #BlackLivesMatter . WASHINGTON (Reuters) – General Electric Co has won a five-year contract valued at up to $2 billion to supply helicopter engines to the government of Taiwan and support a number of U.S. military services, the Defense Department said on Friday. (Reuters) – A U.S. federal appeals court on Friday said BP Plc deserves the right to appellate review of some damage claims awarded to people and businesses in connection with the 2010 Gulf of Mexico oil spill. BEAVERTON, Oregon (Reuters) – President Barack Obama, co-opting Nike Inc’s famous slogan, told Democrats on Friday to “just do it” and support a trade deal with Asian countries that the shoe company said would help it create up to 10,000 U.S. jobs over 10 years. WASHINGTON (Reuters) – U.S. job growth rebounded last month and the unemployment rate dropped to a near seven-year low of 5.4 percent, suggesting underlying strength in the economy at the start of the second quarter that could keep alive prospects for a Federal Reserve rate hike later this year.